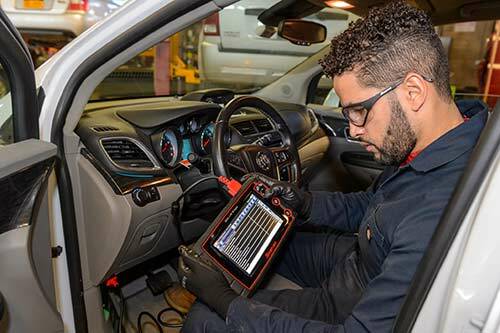 Automotive student Argeni Colladro uses the Snap-On Solus Edge, a tablet-sized diagnostic scan tool. Two new pieces of high-end diagnostic equipment are in the hands of the Hudson Valley Community College Automotive Technical Services students thanks to a longtime supporter. Automotive student Daniel Uber uses the Snap-On infra-red scanning tool, which detects subtle changes in temperature. 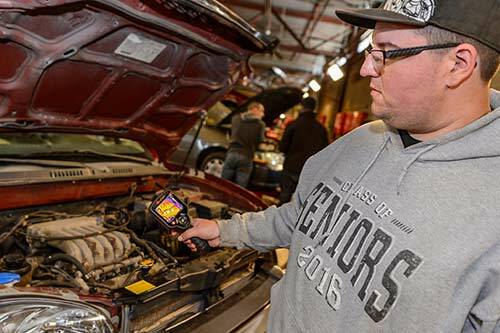 The new Snap-On equipment, including a tablet-sized Solus Edge scan tool and infra-red imaging camera that can quickly diagnose engine problems, is being used by students in the Senior Automotive Lab. "The technology in today's vehicles is constantly evolving and so is the equipment technicians use to make diagnostic evaluations. It is critical to have our students using the same equipment they'll see when they begin their careers in the field, and we truly appreciate the support we received to make this purchase," said Department Chairperson Anthony Kossmann. Automotive Technical Services faculty member Randy Howarth turned to the Hudson Valley Community College Foundation earlier this year for help in raising the money. The program had about $1,000 to spend on the equipment but needed five times that to make the purchase. Relying on a decades-long relationship, the Foundation reached out to Deborah Dorman, president of the Eastern New York Coalition of Automotive Retailers (ENYCAR). ENYCAR has an endowed fund which it has used in the past to support scholarships and equipment purchases. Dorman, in turn, reached out to an affiliate in her network, Leader Auto Resources (LAR), the largest purchasing cooperative of new car dealers in North America, who offered to help, as well. The Foundation received a $2,000 contribution from LAR to match ENYCAR's $2,000 gift and the Automotive Department was able to make the purchase earlier this year. "There is an urgent and critical need for qualified trained automotive technicians and we certainly support any effort to provide the school with up-to-date equipment for that training," Dorman said. Founded in 1953, Hudson Valley Community College offers more than 85 associate degree and certificate programs in four schools: Business; Engineering and Industrial Technologies; Health Sciences; and Liberal Arts and Sciences; and workforce and academic preparation programs offered through the Capital District Educational Opportunity Center. One of 30 community colleges in the State University of New York system, it has an enrollment of nearly 11,500 students, and is known as a leader in distance learning initiatives and worker retraining. Hudson Valley has 80,000 alumni.